These sandals can in the areas of city, beach, playground, school, walking trails and parks are used. The lining has been treated with Aegis Microbe Shield and it has been processed a hydrophobic mesh lining. 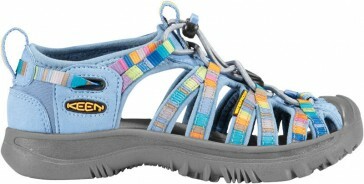 Also owns the Whisper by Keen is a non-marking rubber outsole that is very tough. All children from Keen sandals are machine washable. Please use only a little detergent and set the gentle cycle. Then you can let the shoes easy to air dry.